LET SMOOTHIE RECIPES PRO JUMP START YOUR JOURNEY TO A HEALTHY YOU, FILLED WITH ENERGY! Smoothie Recipes Pro contains 200+ great tasting smoothie recipes and images! Inspire your palate and enjoy increased energy & better health. Browse recipes - drink with your eyes first Prep ingredients - create a free grocery shopping list Easy smoothie recipes - access hundreds of recipes at your fingertips Our growing collection of delicious recipes focuses on the use of whole, unprocessed, nourishing foods. 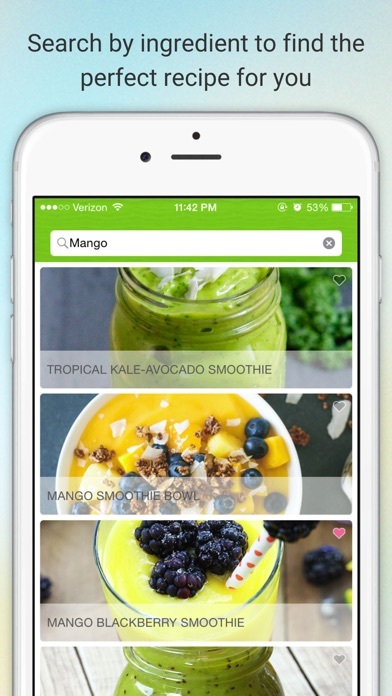 Our app makes it easy for you to recharge your body with all the right nutrients from raw fruits and vegetables. FEATURES: * Enjoy 200+ delicious smoothie recipes at your fingertips * Browse mouthwatering pictures, sure to make you salivate * Bookmark your favorite recipes for easy planning * Create a shopping list for your next grocery trip * Share recipes through Facebook, Twitter and Pinterest * Easy user-interface and engaging design * Available on both iPhone and iPad If you have any questions about the app, please reach out to us at smoothie@getentice.com. If there is a smoothie recipe you'd like to share with us, please e-mail us and send it our way! 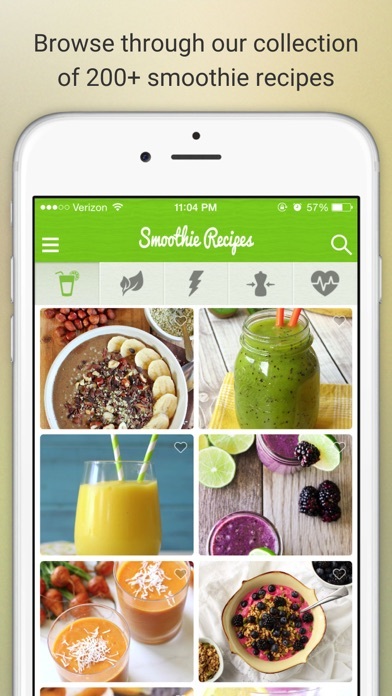 This is a really good app for smoothie recipes. The only thing it is missing is nutritional info. If you could add that it would be perfect. I was hoping for an app that will let you search for smoothies with ingredients you have and also eliminate ones with ingredients you don’t want. This doesn’t do either...it’s just a list of various recipes, which is not what I need. Maybe I need a smoothie-building app: I tell it what I have on hand and it gives me some ideas of what would work well together. I really like the app I use it all the time. Only reason I didn’t give it 5 stars was because it doesn’t give nutritional value of the smoothies. I’d like to know calories, sugars, protein, carbs, etc. Just made my first Smoothie, really hope this becomes a habit. I was missing the seeds and a powder, I will shop for more complete recipe ingredients. Most recipes sound delicious. Thank you for this huge collection. We need the nutritional content! I only gave this 3 stars as each recipe is missing a very important element, the nutritional content (calories, grams of: protein, fat, sugar, carbs and fiber) Please add that, for those of us that are trying to decrease our sugar intake, it is crucial. The app needs the Nutritional information like: Calories, Sugar, Carbs, Fat, Potassium and what ever else. I hope this will be in a future update. I do like that there is a picture showing what the drink will look like. I also did buy the program and support the author. I rally like this app, I have been using it for the past few weeks and I really love the recipes. I wish you could see the names before clicking on each picture and that you would be able to also just click on the name when you are on the shopping list and it would send you directly to the recipe without having to go searching for it. 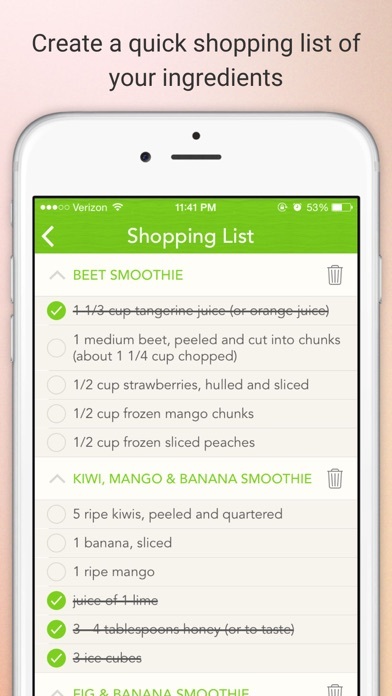 I do my planning the week before and I sometimes forget where I found the smoothie on my list. Otherwise its a great app! 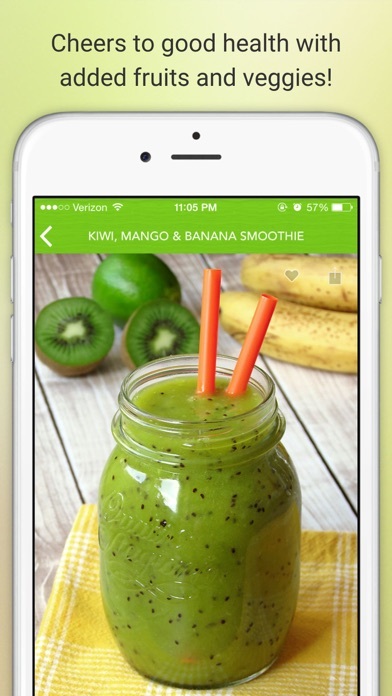 Great app for beginner smoothie makers! The app provides loads of recipes even before you purchase all of them for $2.99. They are broken down into categories so that you can easily find exactly what your looking for.